Stella is working on two projects within APHRC’s Population Dynamics and Reproductive Health Program. The first project seeks to investigate the nature and magnitude of barriers to women’s economic empowerment, and the second aims to understand what works to prevent and respond to Violence against Women and Girls (VAWG) in conflict and humanitarian emergencies. Stella holds a PhD in Population Health from the University of Ottawa (Canada), a Master of Science degree from Concordia University (Canada), and a Bachelor of Science Honours degree from Concordia University (Canada). 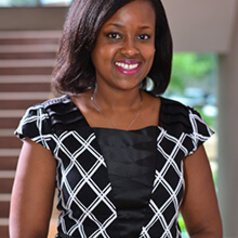 She has previously served as a research project manager for the Champlain Community Heart Health Survey (PURE International Study) and the International Study of Childhood Obesity, Lifestyle and Environment (ISCOLE-Kenya). Stella is driven by a strong desire to help improve the quality of life for individuals through research and intervention. She is particularly interested in modifiable health behaviours associated with child, youth and maternal health.